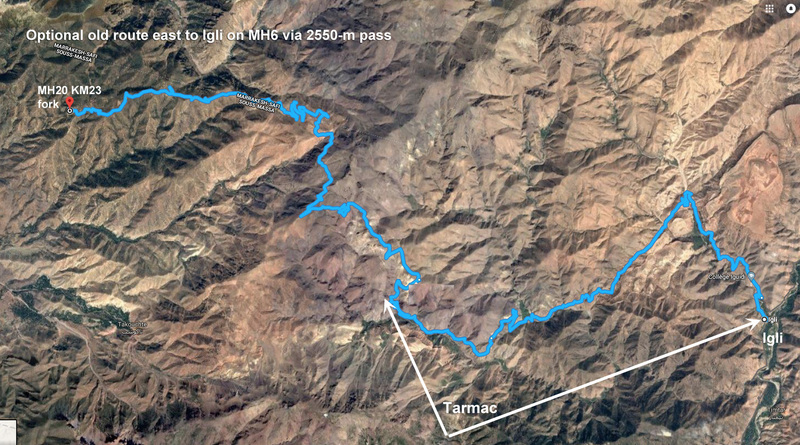 Another High Atlas piste crossing to try alongside MH19 (also in addition to the guidebook). This one only rises to 2200m, climbing some 500m in 8km after leaving the road SE of Ijoukak. (below right). From the pass the incline abates and the track smoothes out as it rolls down towards the villages of the Ouneine basin and the P1735 whose nearly finished extension eastwards may be open by the time you get here (red line on map). 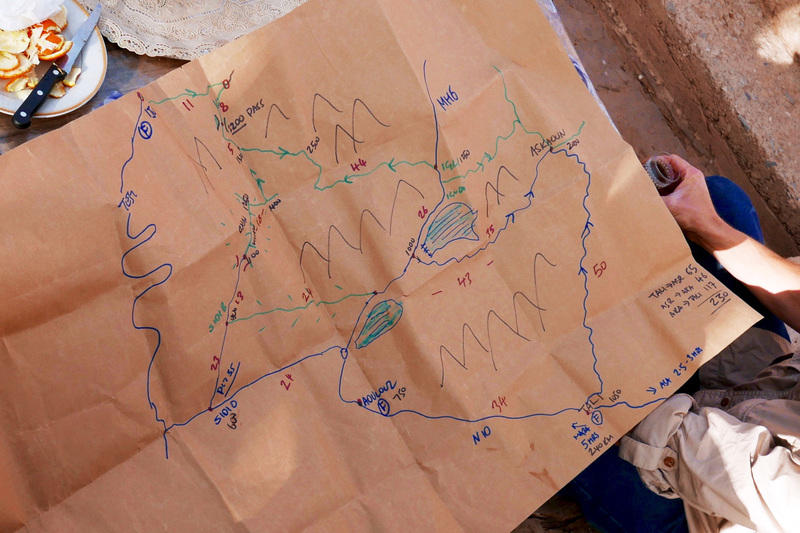 You carry on SW along the P1735 and at Sidi ali ou Brahim village swing sharp left off the road, cross the stream and follow the Ouaougdimt valley piste 24km SE (not fully shown on most paper maps) to join MH6, the road coming down from Aguim on the N9 Marrakech–Ouarzazate road. If you’re in a rush or heading towards Taroudant, at Sidi ali ou Brahim carry on 23km south on the P1735 to ‘Sidi Ouaaziz’ (according to Google) on the N10. Otherwise, it would be a shame to miss out on the scenic Ouaougdimt valley stage, as it rises onto a terrace high above the valley floor. 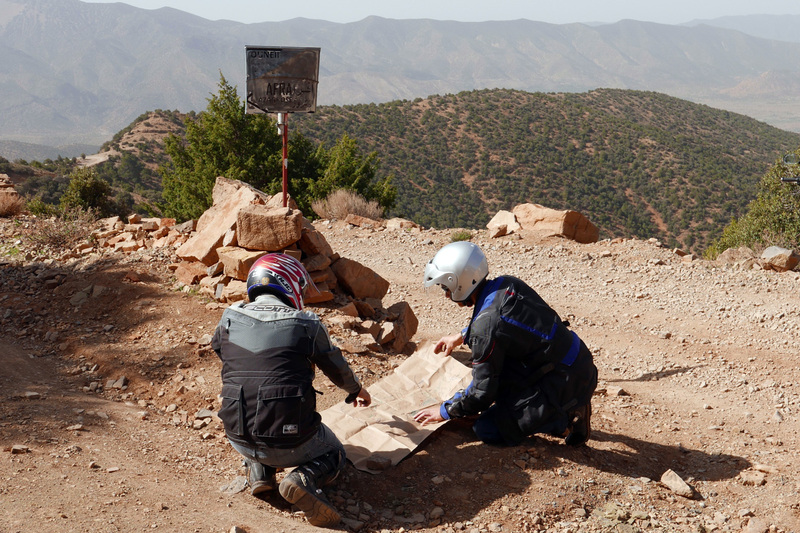 Parts of the route are just about legible on paper maps, least badly on the inset ‘High Atlas’ panel on the Michelin. But none show the full Ouaougdimt valley route. It’s all on Google, Olaf and the OSM digitals. The climb up to the 2200-m Tizi n Oulaoune pass from KM11 is a little steep and loose and about as hard as it gets, but we saw local 125s two-up and minivans, albeit heading the other way (ie: descending). From the pass the gradient eases off while you’ll find the Ouaougdimt valley stage no harder than anything you’ve just done. 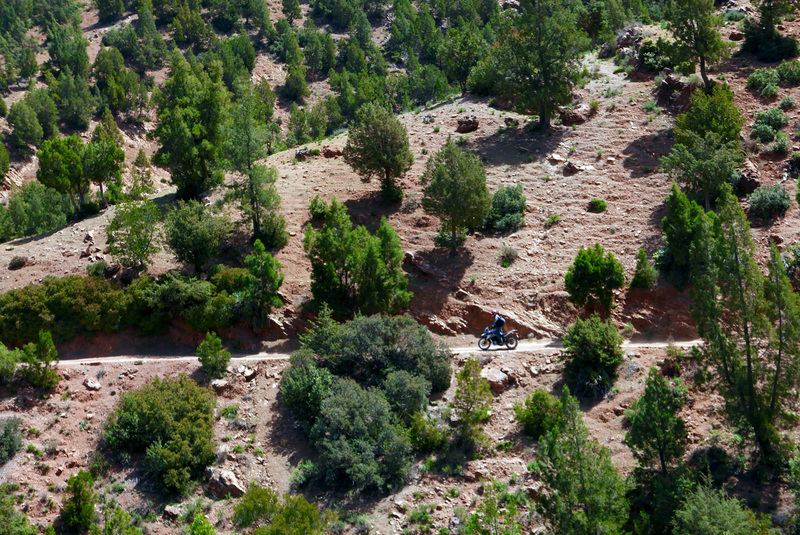 Carefully ridden, a big bike could manage the loose hairpins; so could a 2WD with clearance, though as always these mountain tracks require concentration. 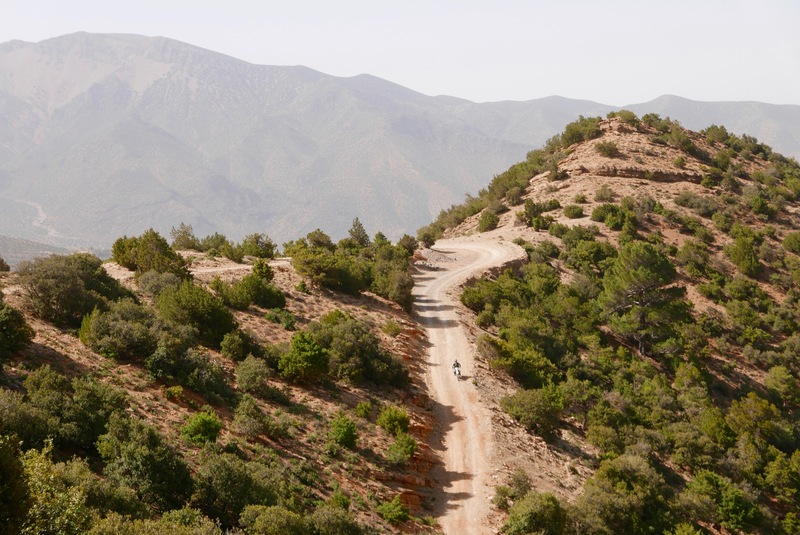 On an MTB it will be a slog if not a push up to the Tizi n Oulaoune, followed by your freewheeling reward and no more steep grades. Easy enough. We winged it just by studying Google satellite imagery carefully beforehand, jotting down some distances between junctions. That’s now all listed below. Download MH20kml file. At the old ‘Afra’ sign at KM23 you may like to try the 46-km track running east. 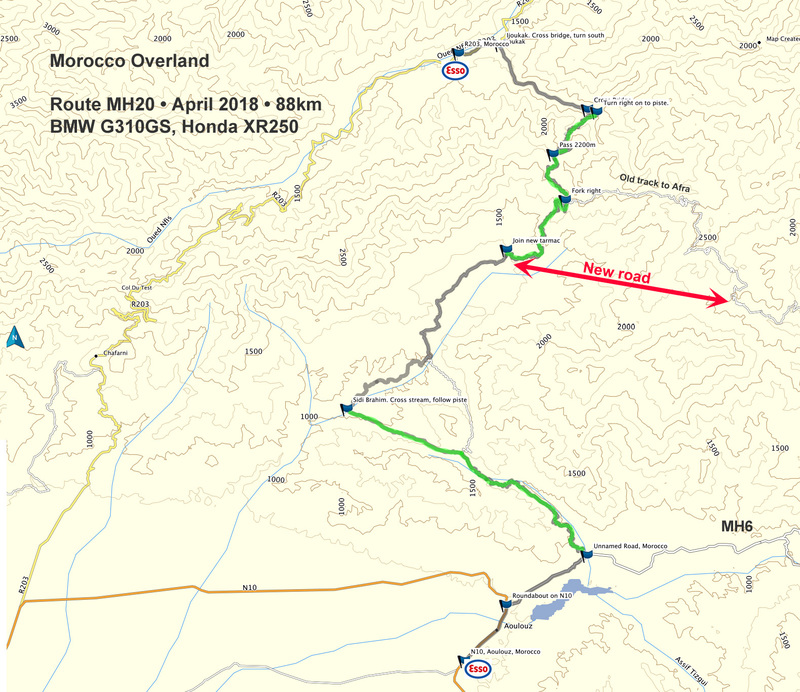 Looks like it leads to Igli on MH6; see map right. Presumably the new road now in the valley is replacing this high-level route which rises to over 2550m or 8300 feet, although I hear it’s sealed from this high point down to Igli. Half day will do you. 0km (88) Talat n Yacoub fuel station on the R203 Tizi n Test road. Head north to Ijoukak. 3 (85) Pass through Ijoukak, cross the bridge and turn right up the side road. Soon you’ll pass a nice-looking auberge. 11 (77) At the fork before a village turn right, drop down over a bridge and carry on. Soon there’s a sign right: ‘Ouadouz/Ouneine? 24km’ (it’s something with ‘O’). The 500m climb to the pass begins. 23 (65) Fork with sign (photo below). Left at this fork is the old track to Igli as mentioned above. Keep right to continue descending to the villages in the Ouneine basin visible to the west. Eventually at a junction around KM35 you join the new extension of the P1735 which is continuing E probably towards Igli following a lower route. The P1735 crosses the basin to the SW and threads through a small pass back into the hills. 54 (34) Sidi ali ou Brahim. Turn sharp left, drop down to the stream and up the other side. The track is a bit rough to the first village, but that’s why they invented suspension. It then eases off as it rises above the valley on a terrace (right) with great views down to the villages below. You could be in the Cevennes or the Pyrenees, but you’re in the High Atlas. It could be worse. 78 (10) Join the tarmac (MH6) by the reservoir. 83 (5) Roundabout on the N10. 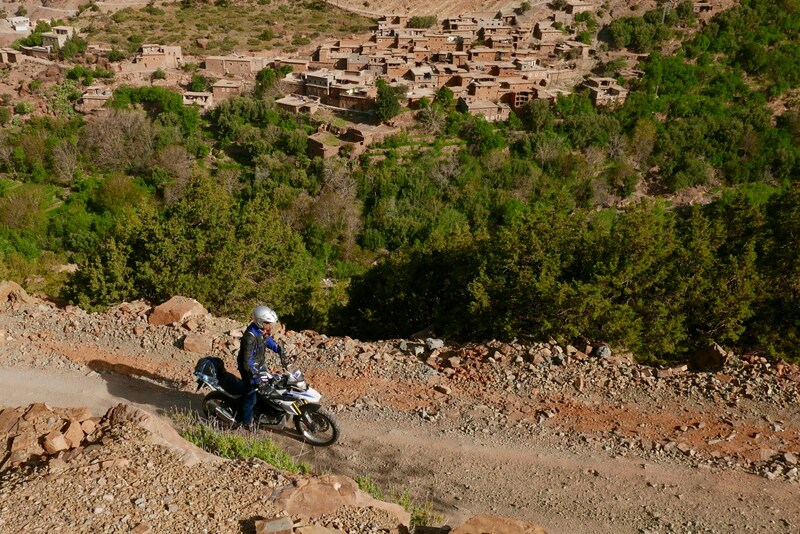 This entry was posted in Morocco Overland, Sahara News and tagged Aoulouz, BMW G310GS, high atlas, Igli, Ijoukak, MH20, MH6, morocco overland, Ouaougdimt valley, Ouneine, Sidi ali ou Brahim, Talat n Yacoub, Tizi n Oulaoune on April 25, 2018 by Chris S.